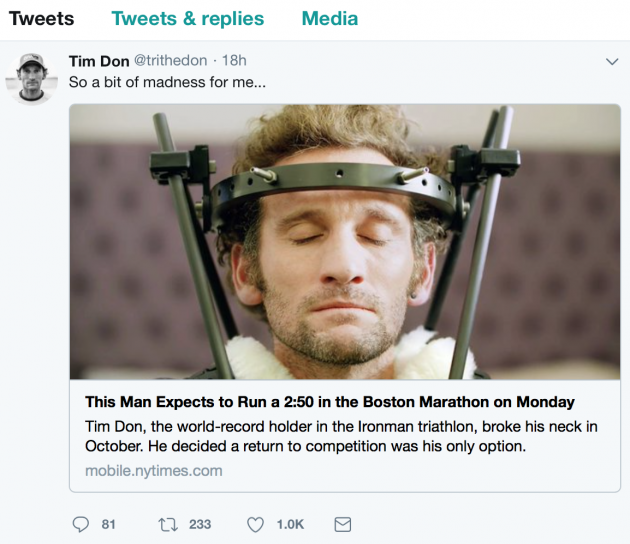 And then there’s Tim Don, the world-record holder in the Ironman triathlon who six months ago suffered a broken C2 vertebra when he was riding his bike and a truck turned and struck him side-on. That break is nicknamed the “hangman’s fracture” because it’s similar to the break caused by hanging. Or doctors could surgically fuse his vertebra. That was the best option in terms of lessening the pain of recovery, but fusing bones would also permanently limit the range of motion in his neck. He could avoid a lot of pain… but would also end his career as an athlete. How painful? For the first three months he had to sit motionless in a chair while his vertebra began to heal. His forehead swelled so badly the holes in his head where the pins were attached started to ooze, and when his wife would try to wipe away the discharge it hurt so badly that Tim would almost pass out. He couldn’t sleep for more than an hour or so at a time. Painkillers made him so nauseous he would vomit. He and his trainer created a plan, focusing not on what he couldn’t do, but what he could do. He rode an exercise bike. He did tons of core work. He uses a snorkel to swim since he can’t yet twist his neck sufficiently to breathe between strokes. And on Monday, Tim will compete in the Boston Marathon — and he expects to finish in 2 hours 50 minutes, the same 26-mile time he ran when he set the Ironman world record in 2017. When you think you’re exhausted, when you think you’re fried, when you think you’ve done all you can, you always find a little more in you. And that’s okay. I couldn’t do what Tim has done. I don’t even want to try to do what Tim has done. So if you have a dream you’re chasing, try harder. You’ll be glad you did — because without effort, you won’t achieve the success you really want… and that you really deserve.